Despite the fact that the opening of the new German capital airport Berlin Brandenburg International BER has been postponed to March 2013, the world’s oldest airshow ILA Berlin Air Show 2012 will take place as planned. 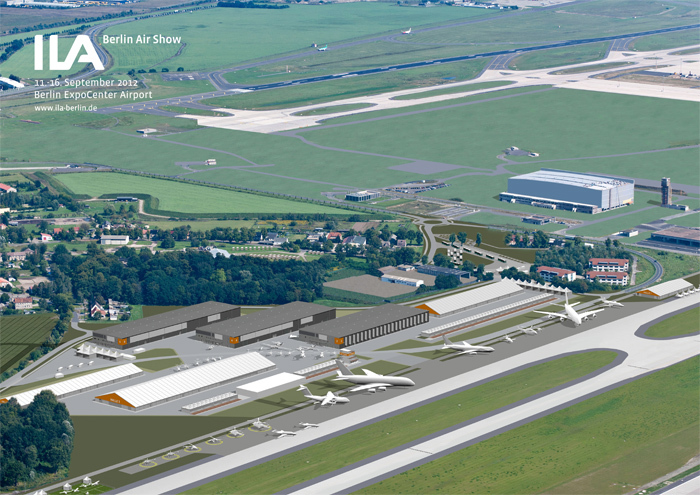 Even if the official airport operations start in 2013 – ILA will take place from 11 to 16 September 2012 at the new venue Berlin ExpoCenter Airport with an extensive flight program and many technical highlights presented by some 1200 exhibitors. Covering some 250,000 square meters (inclusive Static Display Area); the site is directly adjacent to the new capital airport BER and is close to be accomplished. Although the airport BER will not be opened yet, the Berlin Air Show will continue to feature all the numerous and varied aspects of aviation technology. These include a representative presentation of every category of aircraft on the open-air grounds (static display) as well as an attractive flying display for trade visitors and the general public. The organizers of ILA will be applying to the relevant authorities for temporary flight operations areas, as it was the case with ILA 2008 and 2010, and also for the imposition of a restricted airspace, in order to ensure that all activities and the air traffic at ILA can take place without hindrance. Approvals are needed for the temporary flying operations areas for the ILA 2012 that include using the new BER runways, which are already in existence, the adjacent taxiways leading to the ILA grounds, and a connecting area between the northern and southern runways of BER, as the link to the airport’s active runway. To safeguard the display areas outside the airport’s control zone the organizers of ILA are also submitting an application for a temporarily restricted airspace. All guests travelling to ILA 2012 by air will be using Berlin’s airports at Tegel and Schönefeld. The airfield at Schönhagen (appr.15 km distance to the ILA fairgrounds) is available for visitors arriving by private aircraft.